Well, A and Mag are back home now. Our week of fun is over. We had such a good time with them even though we each had to work for part of the week. It was great just to have them here. We didn’t do anything super special. I believe we watched every episode ever made of SpongeBob SquarePants. But mostly we just enjoyed being together. BeeBop and I can’t wait for the next visit!! So, now that the Cocoa Puffs and Trix have been put away, we thought we’d have a hearty, definitely grown-up breakfast this morning. It’s been years since I made steak and eggs and I don’t know why I thought of it now, but I’m glad I did. This was just the right thing to get us going on a day of house cleaning and yard work. I saw these thin cut ribeyes in the meat case at my local Publix yesterday afternoon and they’re what made me think about steak and eggs for breakfast. I’ve never, ever seen thin cut ribeyes like this. 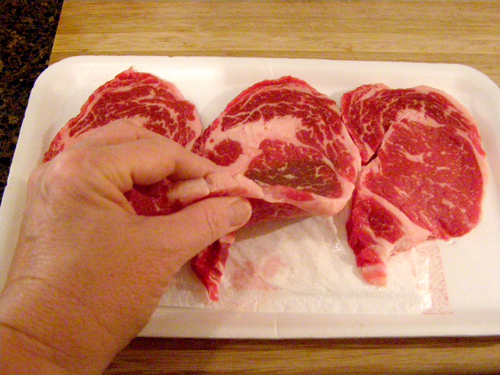 You could use any cut of steak, just make sure it’s very thin so it will cook quickly. These were about 1/4 inch. Generously season one side of steaks with seasoned salt. Now, you do not have to use Lawry’s Seasoned Salt. Honestly, it was just the first thing I saw in the pantry that seemed like it would do an adequate job of seasoning the steaks. Go ahead and season your steaks any way you wish. You could use just salt and pepper or a steak seasoning mix. Whatever you like. I don’t judge here. 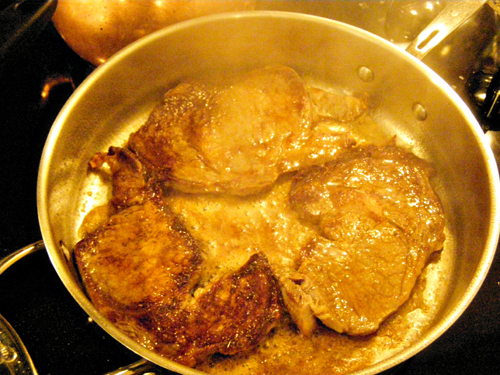 Add steaks to pan , seasoned side down. Lightly season remaining side. Cook 2 minutes and turn. Cook an additional 2 minutes and remove to a plate while preparing eggs. Spray a large nonstick skillet with cooking spray and place over medium to medium-low heat. Melt butter in skillet. 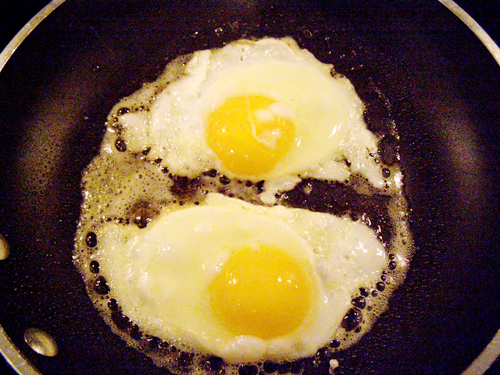 When the butter has melted, carefully break two eggs into skillet. Cover and cook until desired doneness. Now, I’ll be the first to admit that I cannot cook a perfectly beautiful fried egg. You know the ones in the magazines that look like no oil has ever come anywhere near them. They’re perfectly yellow and perfectly white and, well, they look fake. My fried eggs look like eggs. Like fried eggs. So, if you know a secret for making those perfectly beautiful fried eggs, please do share. Along with the steak and eggs we had cheese grits and toasted, buttered soudough bread. Would have been good with hash browns in place of the grits, too. Whatever floats your boat!! I’m off to start cleaning and straightening out the house now. I may resurface sometime before dark. If I’m lucky. Serve steak and eggs for a hearty weekend breakfast. Thin cut, well seasoned steaks topped with over easy eggs! 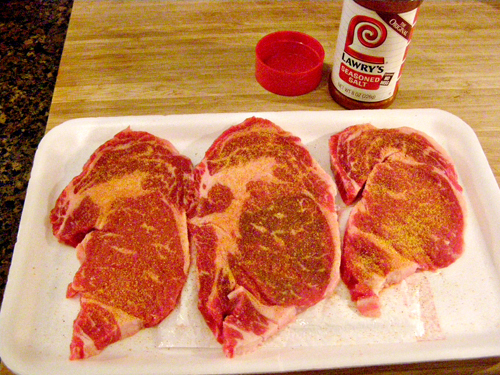 Generously season one side of steaks with seasoned salt. Melt butter in skillet and add steaks, seasoned side down. 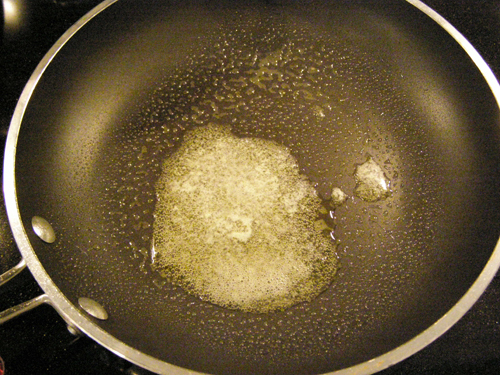 Spray a large nonstick skillet with cooking spray and place over medium to medium-low heat. 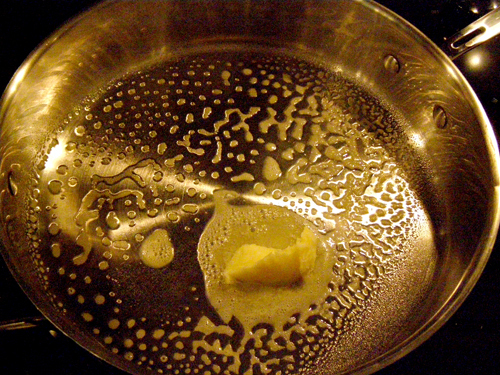 Melt butter in skillet. When the butter has melted, carefully break two eggs into skillet. Cover and cook until desired doneness. Yum! My Husband would LOVE this meal. I actually know how the “show eggs” are done- you have to put ~1 inch of canola oil in your frying pan and over low ish hat cook them, spooning the hot oil only over the tops of the whites. Then you drain them on a paper towel. Too much work for me, but they are beautiful! I know a secret to making the perfect fried egg !! !